Capt. Joseph W. Schultz died May 29 when the vehicle he was traveling in, while on a mounted patrol, struck an improvised explosive device in the Wardak Province, Afghanistan. He was born March 20, 1975 and grew up in Sacramento, Calif. He graduated from the University of Oregon in 1997 and received his commission as an intelligence officer from Officer Candidate School in 2003. His first assignment was to 1st Battalion, 504th Parachute Infantry Regiment (PIR), 82nd Airborne Division at Fort Bragg, N.C. He then served as the assistant battalion intelligence officer and as a rifle platoon leader in A Company, 1-504 PIR. Upon completion of his tour with the 1-504 PIR, he then went on to serve as the counterintelligence/human intelligence operations manager for the 1st Brigade Combat Team, 82nd Airborne Division; and later as the G-2 advisor, 10th Iraqi Army Division. After completing Special Forces Selection and Assessment, he graduated from Special Forces Qualification Course at Fort Bragg. 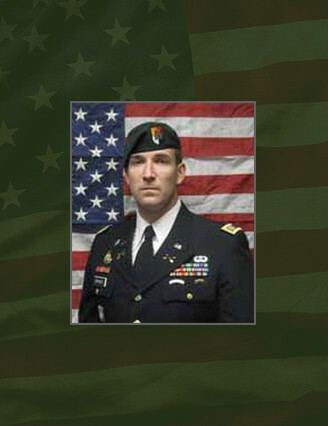 Upon graduation and receiving his green beret, Schultz was assigned to C Co., 3rd Bn., 3rd Special Forces Group (Airborne) where he served as the Detachment Commander of Special Forces Operational Detachment–Alpha 3333. Schultz deployed in support of various operations across the globe, including: Operation Iraqi Freedom, Iraq and this deployment to Afghanistan in support of Operation Enduring Freedom. His military education includes: the Military Intelligence Officer Course, Infantry Captain Career Course, Defense Strategic Debriefer Course, Airborne School, Ranger School, and the Special Forces Qualification Course. Schultz’s military awards and decorations include the Bronze Star Medal, Purple Heart, Army Commendation Medal, Army Achievement Medal, National Defense Service Medal, Afghanistan Campaign Medal, two Iraq Campaign Medals, Global War on Terrorism Expeditionary Medal, Overseas Service Medal, Army Service Ribbon, Combat Infantryman Badge, and Parachutists Badge. He also wore the Special Forces Tab and the Ranger Tab. He is survived by wife Kelly; and his mother Betsy Reed Schultz of Port Angeles, Wash.